Imagine you have partly stolen back the radio station's phone line by dangling a wire round the outside of the building and tapping into the student shop's line at the junction box on the wall outside. Well, the studio now needs a TBU for putting late night request callers from the bar on air. But all you have is a couple of old GPO phones, a bent aluminium box from Maplin and £5 in coppers from down the back of the deliberately steep sided studio guest sofa. Well the answer is probably obvious to all cheap minded individuals, and the instructions are as follows. 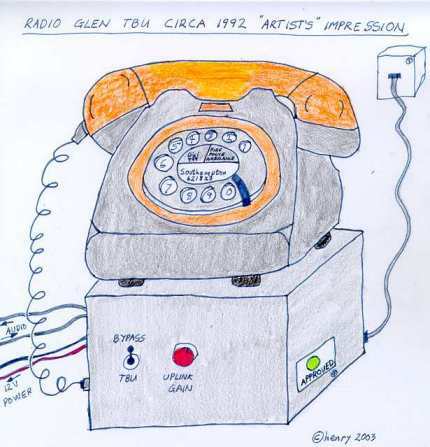 * Take one GPO model 700 dial phone and lead the mic and ear wires out to your aluminimum box. Using £3 of the £5, buy a four way changeover toggle switch and have this wired so that in the bypass position these wires connect directly back to the handset for normal use, or in the TBU position are connected to some old isolating audio transformers found lying around in the technical cupboard. The phone sits conveniently on top of this box. * The ear transformer provides output direct to the telephone fader on the desk. * The mic transformer is driven by an LM380 audio amp (the other £2) fed from the telephone mix output from the desk. There is an uplink gain control on the box to adjust the desk transmit level to the caller. * Place comedy BT green circle "Approved" sticker on the aluminium box. * Optional: Swap over the exchangeable bits of plastic from a grey and a white GPO phone to give stylish two-tone 1960s Prisoner-esque styling. * Connect 12V power from the desk, plug in to phone line and it's "Hello caller on line, errmm, 4!" In hindsight you would've thought that near end crosstalk would have been a major problem, as earpiece sidetone in telephones is usually at a similar level to the received call. I think we were fortunate with the levels and deliberately arranged the polarity of the inputs and outputs such that the sidetone cancelled in the desk leaving the incoming call remarkably clean. Just don't hang up the phone with the switch still on TBU - or a full feedback loop and temporarily deaf ears is the result.